Excavation and site preparation tools, QUIKRETE® Walkmaker form, wheelbarrow or mixing box, shovel, level, margin trowel or finishing trowel. Use QUIKRETE® PowerLoc jointing sand in place of play sand to simulate mortar joints. Sweep the polymer-modified sand into the joints, mist with water, and Powerloc will harden in place. 1. For every two 60-lb. or 80-lb. bags of dry concrete mix, first blend one 10 ounce bottle of QUIKRETE® liquid cement color with 5 quarts of clean water. 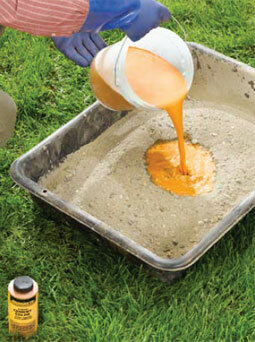 Mix the liquid into the dry concrete until the color is uniform. Add more clean water as needed to achieve the desired consistency. 2. After placing and finishing the path sections, cure the concrete carefully to produce the best color quality. If curing conditions will be less than ideal, apply QUIKRETE® concrete sealer to ensure slow, even curing and good coloring. 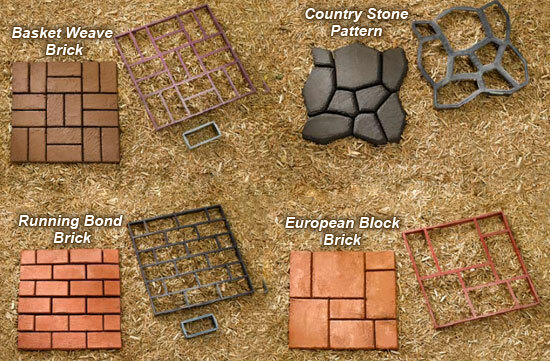 Fill walkway joints with sand or mortar mix to mimic the look of hand-laid stone or brick. 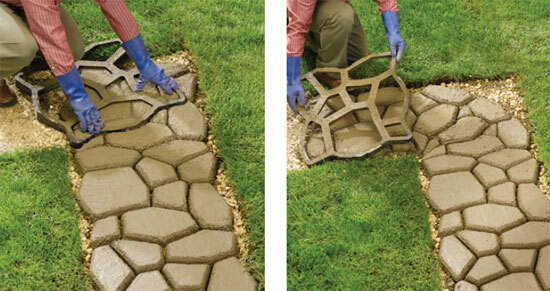 Sweep the sand or dry mortar into the section contours and spaces between sections. For mortar, mist the joints with water so they harden in place.